Bright and authentic adobe, located on 5 acres in the foothills. Serene courtyard with cedar hot tub. Nestled among pinon trees on a secluded road - a serene rural setting complete with a hiking trail out the back door, while offering the convenience of being only 7 miles from the historic plaza. The guest house is a 2 bedroom / 1 bath pueblo style home of 900 square feet (accommodates 4 comfortably in the two bedrooms, but a sofa bed in the living room can sleep two more). It offers privacy, with a separate driveway and walled courtyard. We have been gradually updating the guest house, but you will find that it maintains its authentic Santa Fe style and rustic charm. Bright open-plan kitchen / dining room with colorful Mexican tile counters, and wood, brick, and flagstone floors throughout. It is fully furnished, and the kitchen is fully equipped. A charming outdoor courtyard area is enclosed by a commanding and artful hand-built adobe wall complete with perennial flower garden, landscaping, and mountain views, where you can sit and relax or cook dinner on the gas grill. Beyond the courtyard there is a play fort for children, vegetable gardens, and a beautiful walk in the arroyo, which is shaded by cottonwood and ponderosa pine trees. 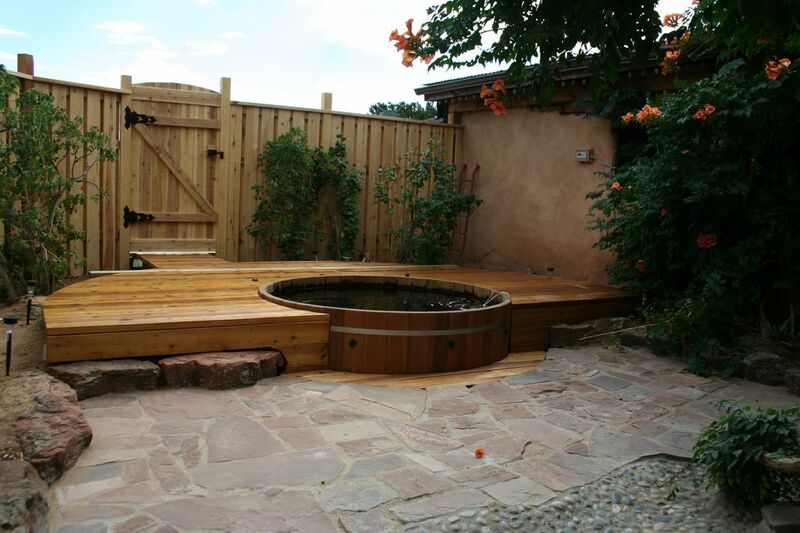 A cedar hot tub (accommodating up to 6 people) awaits in a secluded courtyard. Perfect for stargazing or relaxing sore muscles after hiking or skiing on cold winter afternoons or cool summer nights. Guests enjoy a lovely welcome basket with fresh baked bread and, seasonally, fresh vegetables and flowers from the property's gardens. Jason has been brewing beer for 20 years and is proud to offer a sampling of what he has on tap and a bottle or two of your favorite, upon request. Our electricity, including the energy to heat the hot tub, is 100% solar. With your cooperation, we recycle your containers and compost your food waste for use in our gardens and greenhouse. Angela and Jason have been married for 21 years. We enjoy cooking, gardening, and brewing beer. We have traveled extensively and love to photograph and glean recipes as we explore the world. We are incredibly proud of our three children, ages 19 16, and 12, and are very busy following them in their various pursuits. As a family we enjoy hiking, skiing, and camping in the Sangre de Christo Mountains. We fell in love with this property when we first laid eyes upon it. We were attracted by the unique and funky design of the structures and the tranquility of the tree-lined arroyo. On one hand it is on 4 1/2 acres and affords lots of privacy and plenty of space for gardening, and on the other hand it is a quick drive into town. In fact, we bike into the plaza area several times a week, often taking the Rail Trail, which passes close by out home. Our guest house offers plenty of private outdoor space, which we always value when looking for accommodations, especially when travelling with children. The kitchen is large enough and well enough equipped to easily and comfortably cook a wide variety of meals. There is less light pollution out here in the South East Hills, and the stars are incredibly brilliant at night. Enjoy them while reclining in the hot tub. Recently remodeled bathroom with brick floors and antique claw foot tub. Washing machine. We offer a TV with a PS3 which serves as a DVD player, but have satellite service as well. We can provide a small DVD library (including children's DVDs) upon request. We all enjoyed our stay and the hosts were responsive. It is quite rustic but we liked that about the place. Reasonably equipped. Sadly there was no welcome basket as mentioned in the description or reviews but these things happen. It was not clear to me from the description that the hot tub is in the main house's courtyard but it is just adjacent to the guest house and was nice to use. No issue w cleanliness as mentioned by a previous review--we were comfortable and didn't notice anything concerning. We didn't feel the slatted door between kitchen and bathroom was an issue but if you have mental bathroom hang ups or are traveling w friends rather than family you might. The kids really loved the place. The photos that are shown for this property are NOT current. The landscaping is over-grown and we were not able to walk beyond the walled courtyard. The area where the "childrens fort" was also overgrown and looked as if it might be falling down. We saw nothing that resembled the vegetable garden area. Only weeds and scrub brush surrounded the the property. The hot tub area was missing half the lights and the tub was full of leaf debris. There was alot of noise from the highway. The casita itself is in need of a DEEP cleaning. The shower had used soap (with hair) and the showerhead needs replacing. This the inside of the kitchen cabinets were dirty. I'm not sure about the previous good reviews for 2018 - but we saw a property in need of attention. We left after the 1st night and Jason did refund the remaining nights. We have stayed at quite a few VRBO properties and this is the only property that as not matched the descriptions or past reviews. I wish I could post our photos of the property. Nice overall. Really needs a real bathroom door. This place is charming, and the hot tub is a nice amenity. However, there is just a folding slotted wood gate between the kitchen and bathroom. So basically there is no sense of privacy in the bathroom. Fortunately we have a family full of boys, but even they complained about this. If I had understood about this, I'm not sure I would have stayed here for the price. Additionally, the pullout sofa bed is not functional or useful. We put the mattress on the floor and the kids argued about who had to sleep on it each night because it was not comfortable. Also, no dishwasher, kind of a drag on vacation... The grounds are great for kids though, lots of space to run around outside and no worry about making too much noise. Super cool cathead spider outside the kitchen window that comes alive and feasts on moths at night (don't hurt him!)! Nice hosts. My daughters, my mother-in-law and I had a fantastic stay at the Kirkman guesthouse. It’s a very sweet little adobe casita that we all found very comfortable. My girls also loved that they have a small picture book library. I highly recommend this rental if you’re traveling with children. This was a great place to unwind after a day of hiking and sightseeing. Jason was great and an excellent source of local info. The kids loved the hot tub and I appreciated a place that was authentic and not too fancy since it was our guys trip. It had everything we needed except the pullout sofa had broken springs. I’m not sure the TV worked but we didn’t need it anyway. Surprisingly quiet being attached to the main house and being so close to the interstate. We had a great time! This was a great place for our family: a room with twin beds, an outdoor area for them to explore, a cozy kitchen and living room area for eating and hanging out and, of course, the beautiful hot tub. The bathroom is central in the house and has doors leading in from both bathrooms and the kitchen, so it's not a very private room. This was okay for our family, but might be a bit weird depending on how much you value your bathroom privacy. The property has a very nice homey vibe. The hot tub is beautiful and sitting in it under the stars is magical. Great choice if you're looking for something away from the main drag that feels like a real home. The guest house shares the 5-acre property with the main house, which is also a beautiful adobe built in the early 1900s. The guest house is a separate structure with its own private drive, parking, gardens, and entrances. Property owners, Jason and Angela, have lived in Santa Fe for ten years. We work, brew, and garden from our home, which shares our 5 acre property with the guest house. Given our proximity to the guest house, we are available to guests for key exchanges, site-seeing advice, and anything in between. We are avid hikers and enjoy pointing out the area's best trails. There is an easy arroyo path out the back door that joins with the Santa Fe Rail Trail. For more serious exploration, a short drive in almost any direction will take you into some beautiful country – the Sangre de Cristo Mountains, the Pecos Wilderness, or Bandelier National Monument. Jason is also a chef and micro-brewer and loves to recommend favorite restaurants and Santa Fe hot spots.